The 2013 WSOP reached another final table in a $1,500 No Limit Hold’em event with only two more low buy-in, large field No Limit Hold’em events remaining for the series. Day 3 returned 14 players, including two women, and after a long day of play Dana Castaneda won $454,207, her first bracelet and she is the first woman to win an open event this year. “We were super, super close,” Castaneda said. Molissa Farber, one of the two remaining women, exited in 11th place, Barry Hutter took the chip leader to the final table, Jacob Bazeley entered the final table in the middle of the pack and Castaneda, the lone remaining women, entered the final table as the short stack. The button would pass around the table three times before they lost the first player. It began when Kenneth Gregersen opened for 75,000, Hutter moved all in from the small blind and Gergersen called with pocket jacks. Hutter tabled K Q and was drawing live when the flop fell A A 4 . But the board bricked when it finished 4 K and Gergersen was eliminated. Two hands later Joseph Wertz moved all in for 310,000 from under the gun, Hutter called and Bazeley shipped in his 410,000 from the button and Jason Bigelow moved all in for 1.09 million. Hutter folded and the hands were tabled. Bigelow held pocket aces, Bazeley held A Q and Werz held J 9 . The board ran J 7 4 6 4 , Bigelow scooped with his aces, Wertz was out in eighth and Bazeley was out in seventh place. Thirty minutes later Castaneda opened to 100,000 in the small blind and Hutter made it 300,000 from the big blind. 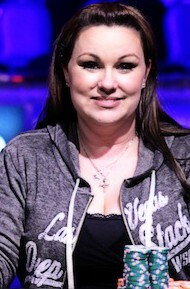 Castaneda called, the flop fell T 4 4 and she led from 400,000. Hutter moved all in for 1.2 million and Castaneda tank-called with pocket threes. Hutter tabled A K and watched the board brick away with 7 3 and was eliminated while Castaneda took the chip lead with four million. The very next hand saw Philippe Clerc opened for 80,000, Michael Zucchet called from the big blind and the flop fell Q T 7 . Zucchet check-called 100,000 and the turn came J . Zucchet checked, Clerc bet 180,000 and Zucchet moved all in for 1.025 million. Clerc tank-called with K J and Zucchet turned up pocket aces. The river came 3 and Clerc’s day was done. The table calmed down for about 30 minutes until Castaneda opened to 150,000 from under the gun and Zucchet re-raised to 375,000. Castaneda called, the flop came A 7 6 , Zucchet bet 365,000 and Castaneda called. The turn came 5 , Zucchet shoved and Castaneda called with A J . Zucchet tabled Q 8 looking for a straight and bricked when it came 8 to go out in fourth place. Another thirty minutes would pass before the final table would be trimmed to a heads-up match.Matthias Bednarek limped from the small blind but Castaneda made it 200,000 to play from the big blind. Bednarek moved all in, Castaneda called with K Q and Bednarek turned up K J . The board ran Q 3 3 6 9 and Bednarek was eliminated in third place. Castaneda started the heads-up match with 7.2 million to Bigelow’s 1.45 million. The two traded small pots for fifteen hands before Bigelow limped preflop and Castaneda checked. The flop fell 7 7 5 , Bigelow moved all in and Castaneda called with 9 5 . Bigelow was at risk with Q 2 and needing a diamond. The board completed T 9 and Bigelow finished runner-up. ePokerReviews.com is the world's largest online poker guide, offering in-depth online poker site reviews, exclusive online poker bonus deals and the most free poker content available on the Web. Inside you'll find expert reviews of major poker sites, daily poker news, over 450 free poker strategy articles, exclusive poker videos and live coverage from poker tournaments around the world.